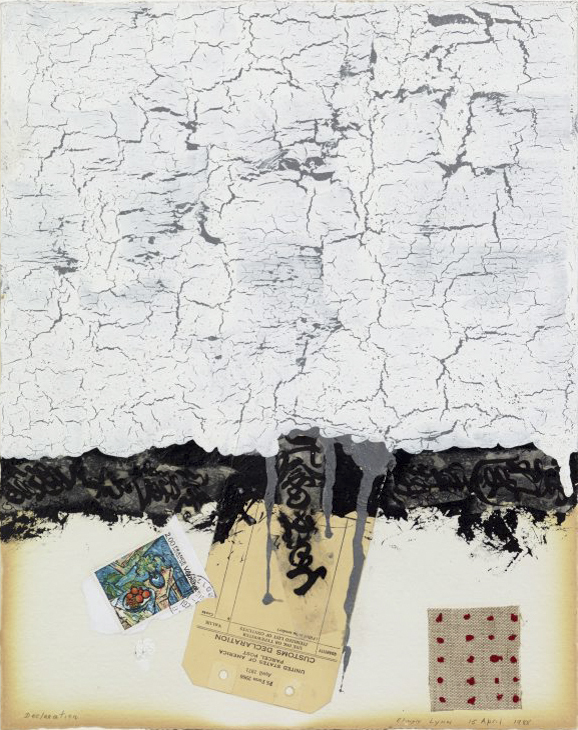 Australia’s foremost texture painter, Elwyn Lynn began incorporating extraneous materials into his paintings and works on paper following a visit to Europe in 1958, when he saw the work of Spanish ‘matter’ painters such as Antoni Tàpies. Lynn subsequently asserted, ‘All my work grows out of collage.’ He was interested in how ‘the stuff of the environment’ could enrich his work. These various fragments contribute shape and texture to an essentially abstract composition. But they also add suggestive power, triggering imaginative speculation regarding their origins and associations. Signed and dated l.r.c., pencil "ELWYN LYNN 15 April 1988".